The University District Community Development Association‘s (UDCDA) “Better on Bailey” grant program is moving full steam ahead, assisting half a dozen property owners on Bailey Avenue with targeted facade improvements and building renovations. Participants in the initiative include many longstanding Bailey Avenue businesses, including Pho 99, Caribbean Experience, Horizon Health Services, and Buffalo Paint & Wallpaper. Newer businesses, including the recently re-opened Varsity Theatre and Bailey Check Cashing are also taking advantage of the matching grant program. 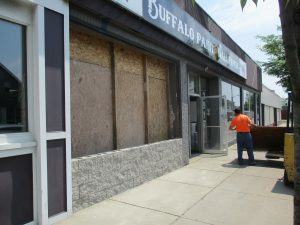 Buffalo Paint & Wallpaper is replacing their current single pane storefront windows with a more energy efficient system. Pho 99, an authentic Vietnamese restaurant located at 3396 Bailey Avenue recently completed the replacement of their flat roof, ensuring they’ll be able to serve up piping hot bowls of Pho for years to come. Caribbean Experience, which has been located at 2897 Bailey Avenue since the late 1980’s, is getting an exterior makeover. New cement board siding has been installed, replacing an old brick veneer, while the second story will get a fresh coat of paint. 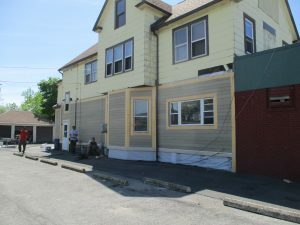 New energy efficient windows and a completely remodeled men’s bathroom round out the renovations and will ensure the Jamaican restaurant will continue their winning streak for Taste of Buffalo’s “Best Meat Item”. Buffalo Paint and Wallpaper, a go-to resource for contractors and avid DIYers at 2917 Bailey Avenue, has had two structural walls rebuilt, while a new energy efficient storefront system is being installed. If you’re looking for one of a kind paint color or designer wallpaper, the newly remodeled Buffalo Paint & Wallpaper is just what you’re looking for! Matching grants like these are critical to assisting small businesses make much needed improvements while keeping commercial corridors like Bailey Avenue thriving. These types of Main Street grants also help improve corridor aesthetics and spur further private investment. The last few years have seen significant progress on Bailey Avenue, thanks to a steady, grassroots momentum. A 2013 Urban Initiatives grant awarded to UDCDA and Ibrahim Cisse made possible the transformation of the historic Varsity Theatre, from a shuttered building to a one-of-a-kind entertainment venue and anchor institution in the neighborhood. The “Bailey Fights Blight” initiative, launched in 2014 by the Bailey Avenue Business Association and the University Heights Tool Library, has brought community groups together to beautify the streetscape, board up vacant buildings, and participate in public art projects. Since that time, residents and volunteers have continued regular cleanups, painting days and gardening projects along Bailey and the surrounding streets. These community-based efforts continue to breathe new life into Bailey Avenue and the neighborhood continues to see improvements in the form of investments, new businesses opening, and sale of vacant properties. Caribbean Experience’s facade newly framed out with high quality cement board siding. Better on Bailey is funded through a $300,000 Buffalo Main Streets Initiative Grant awarded to the UDCDA by Empire State Development and administered by New York State Homes and Community Renewal. This funding is designated specifically for projects that encourage density along transportation corridors and revitalize neighborhood commercial districts. This recent injection of funding from the Buffalo Billion will usher in the next phase of UDCDA’s plans to transform Bailey into a thriving commercial corridor and hub for small business growth. The Better on Bailey initiative provides property owners with matching grants up to $50,000 per building. Funding can be used for renovations including façade improvements, awnings, signage, lighting, and the build out of interior commercial and residential spaces.